The Great Rank Debate, Is It Finally Over? Okay, it’s settled, Google’s toolbar PageRank isn’t going anywhere. We’ve been hearing for years that Google PageRank is on its way out and, I hate to disappoint everyone, Google’s Matt Cutts just squashed that rumor. The PageRank debate is partially logical with a little jealousy mixed in. I agree that PageRank is outdated and its importance seems to be diminishing. With that said, have you noticed who screams the loudest about PageRank? That’s right, those without it; or at least those with less than they feel they need. I’ve said it before, numbers do count, like it or not. 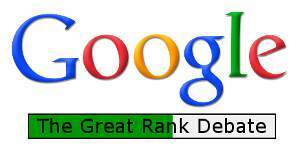 So is the Great PageRank Debate finally over? I seriously doubt it. Now that we know Google will keep it’s toolbar rank around for awhile, at least until browsers no longer support it, we’ll continue to argue what the numbers mean and how important they are. Hey, we don’t want to get too boring, do we?